It’s me!!! Kareen. I’m back with another layout. Yeah! I, of course, used the Sorbet May kit? Did you fall in love with it? Not yet? Well, what are you waiting for! So, here is my layout! For the background, I used the Kaisercraft paper from the kit. It was perfect for watercolor and for a resist effect. As you can see, I used a lot of embellishments from the kit. I only add flowers. I also used a 3″x 4″ card from the 12″x12″ Kaisercraft paper. I watercolored it the same color of my background. I also used the printables that goes with the kit. A good way to embellish your layout! And a little extra today…. I made a video! Thanks for stopping by and see you next time! Categories: CK Kits, Design Contributor, Uncategorized | Tags: Bella Blvd, clique kits, mixed media, pretty little studio, scrapbooking | Permalink. totally in love with this!! 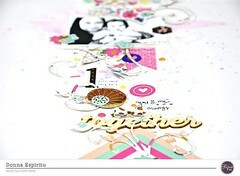 Gorgeous Layout Kareen!!! It’s so perfect and pretty! !